Californian Wine Grape Regions - Gino Pinto Inc. The same California grapes that are used by the finest wineries in the U.S. are now available to home winemakers and commercial wineries here on the East Coast. Gino Pinto Inc. has established long-term relationships with California growers from wine regions all over the state who provide grapes of exceptional quality. These grapes are handled and packed with care from the vineyard and shipped refrigerated direct to our door ensuring that the grapes are delivered in the best condition. Described below are some of the California wine regions where we source our grapes. The Central California valley wine region lies east of San Francisco Bay in the central California valley and runs south through the Sacramento and San Joaquin valleys to Bakersfield. Viticulture in California’s vast interior valley, nestled between the state’s coastal mountain range and the Sierra Nevada, is actually two valleys: the Sacramento Valley in the north and the San Joaquin Valley in the south, which includes the Delta area located in the middle where the two valleys meet. Although the Sacramento and San Joaquin Valleys are not designated AVAs, the region produces 71 percent of the state’s wine grapes and is home to eight AVAs — Clarksburg, Diablo Grande, Dunnigan Hills, Lodi, Madera, Merritt Island, River Junction and Salado Creek. The Sacramento Valley runs for approximately 120 miles from Red Bluff in the northern end of the valley to the city of Sacramento. Bordered by the Sierra Nevada to the east and the Coast Ranges to the west, this level, sun-drenched, agriculturally rich area is unaffected by ocean influences. The San Joaquin Valley is filled with fertile and rich soils, which are among the richest and deepest in the world. 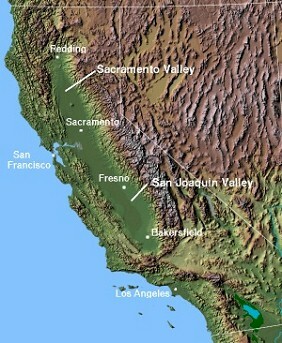 The mountain ranges in this region drain into the San Joaquin River, and the river deposits the deep loam (equal mixture of sand and silt) soils, which are characteristic of the region. The combination of soil and regional weather creates growing conditions that are often ideal and create vines that are naturally vigorous. Located directly north of Sonoma County and about 90 miles north of San Francisco, the Mendocino wine region is bounded by California’s Coastal Mountain Range, the Pacific Ocean and the great northern redwood forests. Mendocino County is highly diverse with coastal influences, mountaintops, river valleys, and inland regions that have either Mediterranean like climates or like Northern Europe. Two websites where you can learn more about Mendocino County are Gomendo and Cal Wineries.